Warning may look cute and cuddle but I'm locked and loaded patch measures 4x1.5 inches and is embroidered in Black / White / Red. 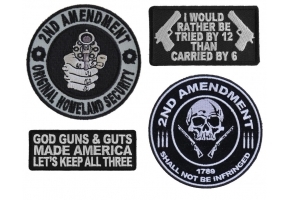 You can sew this patch on your leather or nylon jacket. It features die cut borders for easy sewing. We also have treated the plastic backing of this patch with heat activated glue. 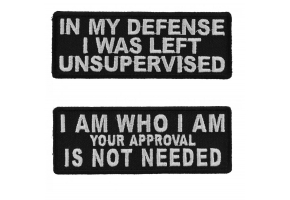 You can also iron on this patch to your clothing. The plastic iron on backing not only gives you the capability to iron on the patch, but it also helps keep the stitches together over time. 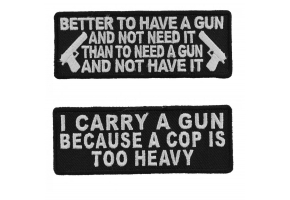 This is another quality embroidered iron on patch from The Cheap Place. Please refrain from ironing on patches to leather or nylon. 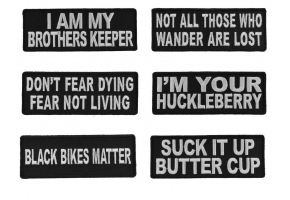 Since we cater mainly to Bikers who get them sewn on leather we make sure all our patches feature single color borders for easy sew on application.